Don’t miss the next edition of DJAZAGRO, the trade show for agri-food production, which will exceptionally be held from 25 to 28 February 2019 at SAFEX Palais des Expositions, Algiers, Algeria. Our exhibitors will be present once again this year to stay in touch with their Algerian and North African customers and look ahead to future developments in legal regulations governing imports. The Bakery of the Future, an actual operational industrial bakery, will once again be installed and working in the central pavilion, thanks to our partners Diane Industries, Eurofours, JAC, Panem and Bongard under the patronage of trade association EKIP. The Algerian Chamber of Commerce and Industry will once again organise “Invest & export business meetings” in the form of a round table on various themes including Algerian investment regulations, financial and contract security, and export taxes and customs formalities. The Algerian-French Chamber of Commerce and Industry will give a presentation on investing in Algeria from the viewpoint of foreign companies. Talks of a more technical nature will also be on the agenda, dealing with packaging and capitalising upon local production. L’ADEPTA, the association of specialist French firms which manufacture equipment and production units for food processing in France and abroad, and partner of DJAZAGRO since its creation, will organise a seminar aimed at Algerian investors. The theme is as follows: “Agri-food industry, how to optimise your factories”. 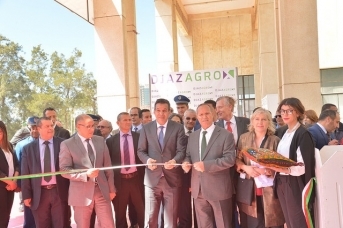 For the second consecutive year, DJAZAGRO will directly promote exhibitors’ new products through a platform available online at www.djazagro.com. Exhibitors can upload all the relevant information on their new and/or headline products which will be exhibited at the show, and visitors can consult this information as they plan their visit.